As much as I love new beauty products and innovations, they rarely blow me away. I’ve only worked in beauty for four years, but I feel like I’ve seen it all already. So when a product comes along and truly knocks my socks off, I do a little happy dance. 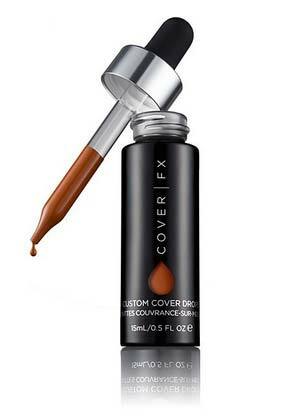 That was the case with Cover|FX’s new Custom Cover Drops, a pure liquid pigment that you add to your favorite moisturizer, serum, face oil (!!) and even primers to turn them into a custom coverage foundation. No, this is not an early April Fool’s joke. At a press event for the product this week, my fellow beauty editors, bloggers and I were all picking our jaws up off the floor after getting a closer look at these drops. I was skeptical at first (especially when they told me I could put it in my face oil), but after seeing and touching the product, I was 100 percent on board. The Custom Cover Drops are made with a “Flash Fusion technology” that weightlessly transforms your skincare product and turns it into a fully customized coverage foundation, without sacrificing the skin-beautifying ingredients in your product. The best part? You can mix up a concoction that's as sheer as a tinted moisturizer or as heavy as a full-coverage foundation, depending on how many drops of the pigment you add. One drop gives you sheer coverage, two drops for medium, three for full, and four drops for total coverage. All you have to do is mix it with your finger and apply. In other words, buying multiple types of makeup for different seasons and/or occasions is over. See the magic for yourself in the video below. The Cover|FX Custom Cover Drops ($44) are available in 25 global shades for a perfect match. Get yours at Sephora or CoverFX.com.